And Yet They Deny: New Age Awakening - NBA Player Ron Artest Changes His Name To "Metta World Peace"
New Age Awakening - NBA Player Ron Artest Changes His Name To "Metta World Peace"
R on Artest is a renowned athlete in his field, playing in basketball's highest professional league, the National Basketball Association (NBA) for over 10 years. 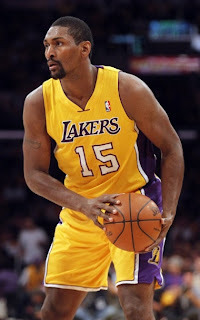 Since being drafted in 1999, Artest has shown his talent and is often ranked amongst the best defensive players currently in the game. Unfortunately, the high-profile star is talked about just as much if not more, for his controversial antics on and off the court - and his latest act of changing his name galvanises his status as a subversive cult sports figure. On Friday 16 September 2011; the small forward for the Los Angeles Lakers officially changed his name to Metta World Peace: "Metta is going to be the first name and it means like friendship, love and kindness," Artest told Stephen A. Smith on 710 ESPNLA earlier this month. "World Peace is going to be the last name, so everybody can get ready to buy their World Peace jerseys.". In a separate article, he goes on to say: "I changed my name because I got tired of Ron Artest, he's a [expletive]," said Metta World Peace. "And when fans get mad at me, they can't say, 'I hate World Peace.' " . The name Metta derives from Buddhist traditions and culture. 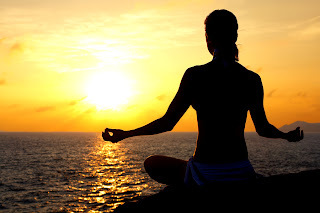 It's a state of mind in which one generates energies within the mind via various meditation processes. These energies can then be harnessed and transmitted to others through one's actions of what appears to be good deeds of care, generosity and benevolence. World Peace's publicist states that "Ron Artest, (World Peace) has contemplated the name change for years and always knew that he wanted his last name to be World Peace but it took many years of research and soul searching to find a first name that was both personally meaningful and inspirational,". 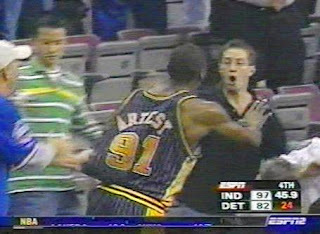 Artest is most argubly known for getting the longest suspension in NBA history due to his participation in the brawl between his team at the time, the Indiana Pacers and the Detroit Pisons in November 2004. Nicknamed "Malice At The Palace"; troubled erupted after Artest was unhappy with being given a foul for being overly physical with Pistons power forward/ Centre Ben Wallace right under the basket. Artest protested his innocence by laying on the scorer's table, only to have a cup of soft drink being thrown at him from the crowd. He then rushed into the stands and punched a spectator whom the thought drenched him; but it wasn't. Mayhem ensued and fisticuffs spewed onto the court as players from both teams joined in for a piece of the action. Artest was banned from playing for the rest of the 2004-5 season (86 games), and lost salary wages within this period of time which amounted to about the $5million dollar mark. Aside from that, the 6' 7" 31-year old Queens, New York native has been suspended on numerous occasions for flagrant fouls, and has been noted for erratic and unprofessional behaviour such as turning up for practice in a bath robe, and drinking Hennessy cognac at halftime in the locker room when he was a rookie at the Chicago Bulls. 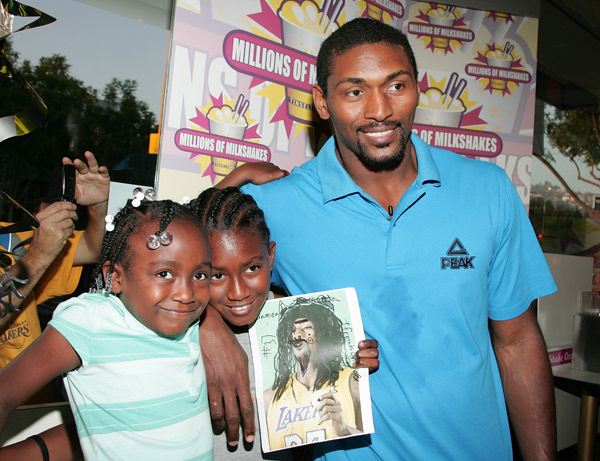 However, in recent years, Artest has appeared to have turned over a new leaf. Upon winning the World title with the Lakers in 2010, "...he raffled off his 2010 NBA Championship ring to help youngsters with mental illnesses and he won the NBA's citizenship award for his philanthropy in that field.". Amongst other commendable actions, one that's worthy of noting is Peace's appearance as a contestant in the latest stint of the TV celebrity competition Dancing With The Stars. World Peace hopes to have his 8-year old daughter change her surname to the aforementioned.